July is Worldwide Adventure Writing Month '08. The goal is to write a complete RPG adventure by July 31st, 2008. It's half a year late, but the official Worldwide Adventure Writing Month downloadable archive is up and running. Click here to check it out! Big thanks to James Hutchings of Age of Fable for agreeing to host the WoAdWriMo adventures! My apologies to all the contributors and other interested parties for the horrible delay. Tomorrow Worldwide Adventure Writing Month '08 begins and we've got the new website up and running just in the nick of time. Please go check it out and maybe start a thread in the forum section! What System Should I Pick? WoAdWriMo '08 is less than a week away. Maybe you've already decided to take the WoAdWriMo Challenge and write your own RPG adventure to share with the world. But what system should your game be written for? Of course you are absolutely free to pick whatever game system you want to write for. The soon-to-be-relaunched WoAdWriMo website exists to host games for darn near any system. But if you're having trouble picking a system, here are some different directions you could go in making your choice. This is the easy one. If there's one system that really speaks to you as the end-all and be-all of RPGs, then you should write for that. You'll be doing yourself a favor. There's nothing wrong with turning the enthusiasm of a fad into the energy to write an adventure module. Mutant Future is on my own personal shortlist mainly because it's new and shiny. Well, that and the spidergoats. Maybe you took the challenge last year but didn't quite finish your module. Dust that baby off and finish it off this July! Of course, if a new edition of the RPG you wrote for has hit the stand you might want to make some changes. If there's one system you know like the back of your hand, don't hesitate to leverage that knowledge to make your WoAdWriMo project easier to complete. When was the last time you wrote an adventure using one of your favorite systems from the good ol' days? Maybe after you're done you can contact some gamer buddies from bygone days and play it through. Maybe there's a game system that's been your own personal white whale. You have trouble understanding it or making it work. Here's an opportunity to sit down and really tackle that beast one more time. If you've got a cool adventure idea but can't figure out a system to fit it, please work on it anyway! Some people get weirded out by systemless adventures, but there IS an audience for such work. If you're reading this, thanks for keeping WoAdWriMo in your feed! This year we're going to do Worldwide Adventure Writing Month in July instead of June. That should give you some time to digest that new set of rules you just bought and get your ideas together. One major change to the program this year: no page count goal. Let me repeat: no page count goal. Last year's goal seemed to discourage people even though it was an admittedly arbirtrary bar. This year make the best adventure you can and don't worry about how big or small it is. Page count is kind of a dumb way to measure the size of an adventure anyway. Stay tuned in the month of June for more WoAdWriMo info! Worldwide Adventure Writing Month '07 is officially over. Let's hand out some thank-yous to everyone who made this project a success! Martin Ralya, for volunteering Treasure Tables as a home for our Adventure Archive and Forum and offering lotsa general support. WeaveWarden of Myth-Weavers, for great advice (both here and in private) and offering to make all our adventures more accessible for online play. Peter Seckler for being the first to complete the challenge, thereby showing the rest of us that it can be done. Jay A. Hafner, Phill Winters, Gabor Lux and Bobby Derie for completing their WoAdWriMo projects in the time alotted, proving that Peter isn't some sort of superhuman freak. Industry professionals Mike Mearls and S. John Ross, for their great advice and words of encouragement. All the WoAdWriMo forum participants and everyone who commented here on the WoAdWriMo blog. The people on my blog who encouraged the project, especially Dave and Stuart. Most especially I want to thank everyone who took the challenge, whether you turned in a completed adventure or not. You all rock! So where do we go from here? As I explained yesterday, it's never too late to turn in your own WoAdWriMo project. Or join us next year as we all get together to tackle WoAdWriMo '08! In the meantime, please make use of all the great free adventures we can offer the public. Spread the word about the existence of our Adventure Archive. Writing these adventures was only half of the WoAdWriMo equation. The project won't be complete until people are using these adventures. 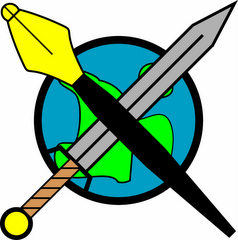 If you or anyone you know runs any of the adventures in our archive, please stop by the WoAdWriMo Forum and tell us all about it! And if you can think of any way we might improve on WoAdWriMo, any service we can offer or technique we can adopt to make next June a bigger success, please let us know! Drop by our forum or email me directly at jrients AT gmail DOT com. We've got another adventure added to the WoAdWriMo Adventure Archive. Bobby Derie presents Zero Sum Gain, "intended for use with Shadowrun, Fourth Edition and no other supplements or sourcebooks are required for play (though the players and gamemasters may find Runner Havens and Street Magic useful for reference)." Congratulations to Bobby! We're pleased to be able to add another adventure to our archive, especially one for a system we didn't already have covered. Today is the last official day of Worldwide Adventure Writing Month. We'd like to congratulate Phill Winters for completing his project, the D&D 3.5 adventure Skyfell: the Discovery. Way to go, Phill! His work is available for download, along with all the others we've received, at the official WoAdWriMo Adventure Archive. Drop the project and try again next year. Response was sufficient that your WoAdWriMo team will be at it again in 2008. We'd like you to be right there with us. You can start a new project or pick up where you left off this year. Turn in an unfinished adventure. One of the major goals of WoAdWriMo is to provide free materials for GMs. If you think your incomplete project could still be of use to others, we will gladly accept it into our archive. We'll label the work 'incomplete' as a courtesy to prospective downloaders, but that doesn't mean your work is unappreciated. Thank you for your contribution! Keep working. We will gladly accept late submissions. Our one month time limit has always been a guideline, not a straightjacket. If you've got an adventure to share, we'll host it even if you turn it in 11 months from now. We want to show the world your awesome work, no matter when you finish it! Note that these options can be used in conjunction. If you want to submit what you have now, but update your work later, we're game. We simply ask that you not overload us with a large number of updates on the same project. Send all your adventures and updates to martin AT treasure tables DOT org. Please label the email "WoAdWriMo submission" or something like that.